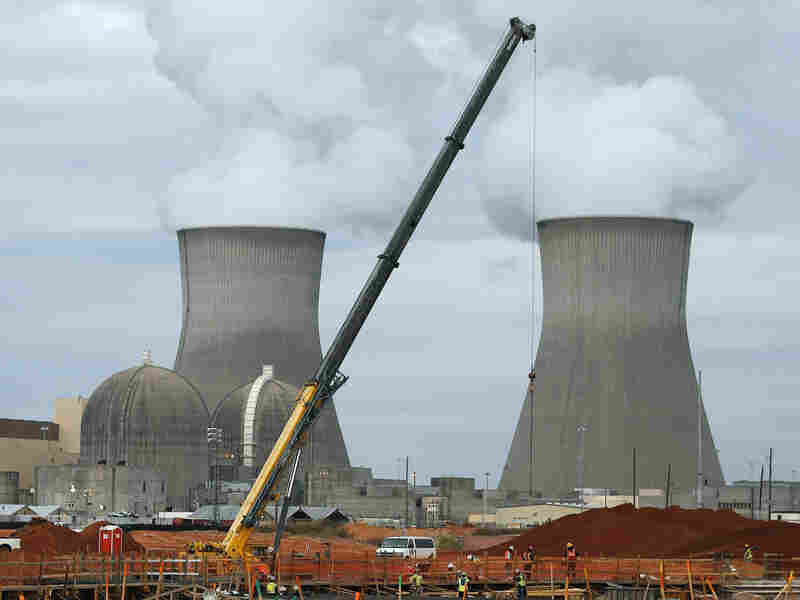 U.S. Government Will Back Loans For Nuclear Power : The Two-Way The $6.5 billion in federal loan guarantees will help build the first new U.S. nuclear power plants in more than three decades. The announcement brought quick criticism from some environmentalists. The containment vessel for a new nuclear reactor at the Vogtle nuclear power plant under construction near Augusta, Ga., in December 2012. Energy Secretary Ernest Moniz announced a multibillion-dollar loan guarantee Wednesday for building nuclear reactors in Georgia, underscoring the White House's plan for an "all of the above" energy strategy. The two reactors will be the first built in this country in nearly three decades. President Obama "sees nuclear energy as a part of his carbon-free portfolio" that also includes renewable energy sources, Moniz said during a speech at the National Press Club in Washington. "We are working across the board to push the technology forward into the marketplace for all of our energy sources." Moniz said he would finalize the loans on Thursday during a trip to Georgia. The announcement brought quick criticism from some environmentalists. In a statement, Katherine Fuchs of Friends of the Earth pointed to a nuclear disaster in Japan. "Fewer than three years have passed since the tragedy at Fukushima demonstrated that nuclear reactors can never be safe. Yet the president and energy secretary are ignoring its lessons," Fuchs said. But Moniz said the administration wants to fight climate change by encouraging development of an array of energy sources that have lower carbon emissions. This particular effort to help nuclear energy has been pending since February 2010 when the White House gave conditional approval for loan guarantees for a nuclear power project in Waynesboro, Ga. When the deal is finalized Thursday, Georgia Power and Oglethorpe Power will receive a combined $6.5 billion in loan guarantees to finish building the Vogtle nuclear plant expansion. A third Vogtle partner, Municipal Electric Association of Georgia, has yet to complete the steps for a proposed $1.8 billion guarantee. The three partner companies are building two Westinghouse units using new designs. "The innovative technology used in this project represents a new generation of nuclear power with advanced safety features and demonstrates renewed leadership from the U.S. nuclear energy industry," Moniz said. The loan guarantees, part of a 2005 energy bill, were intended to revive nuclear plant construction. But over the years, the initiative has run into stumbling blocks over how the loans would be secured. Closing the deals on Thursday will mark "a major milestone in the administration's commitment to jump-start the U.S. nuclear power industry," Moniz said. But Fuchs said the loan guarantees are not a good deal for taxpayers because "nuclear reactors are too risky to finance, too slow to build and too dangerous to be part of a meaningful energy solution." Advocates for nuclear energy are pleased by the U.S. loan guarantees. Scott Peterson, vice president at the Nuclear Energy Institute, an industry group, says the agreement sends a message that nuclear power is still attractive, even after the catastrophic melt downs at the Fukushima plant. "As we start to see the economy bounce back, and we see electricity demand start to increase, I believe we'll see more nuclear plants being built," Peterson said. NPR reporter Geoff Brumfiel contributed to this story. You can hear Geoff's report on Thursday's Morning Edition.